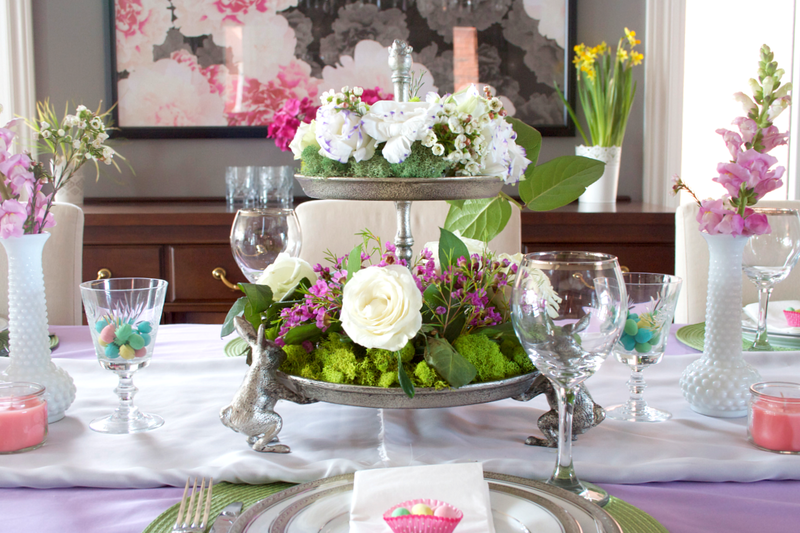 elliven studio: Easter Tablescape Decorating! I'm super excited about today's post! 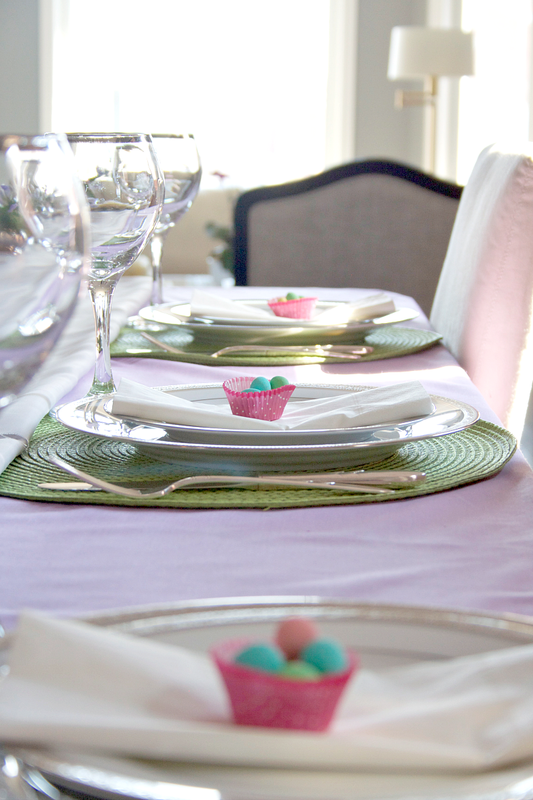 With Easter right around the corner, it's time to start thinking about how to decorate the table for this beautiful holiday. 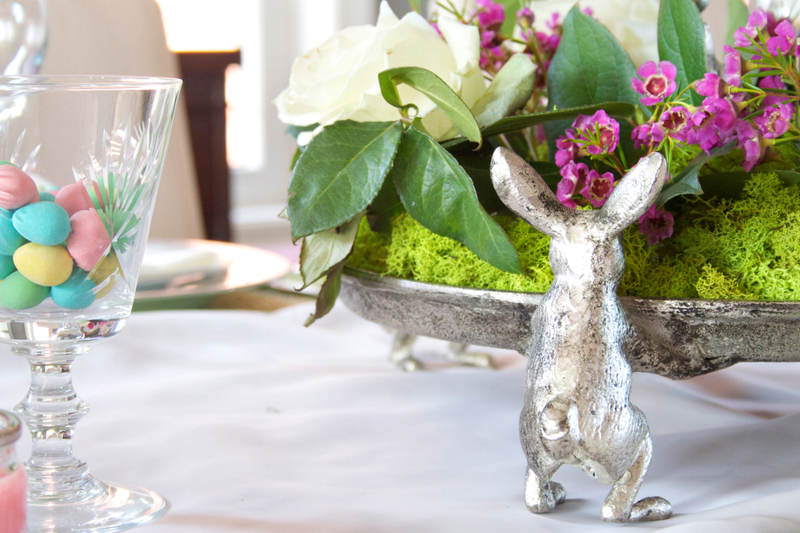 I had the absolute pleasure of styling a gorgeous antique-silver bunny & chick serving tray from Pottery Barn! 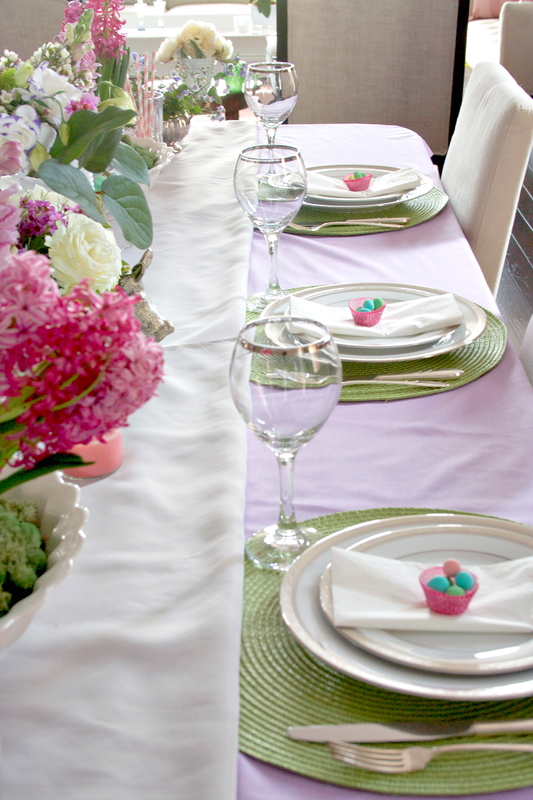 So today's post is all about Easter tablescapes! 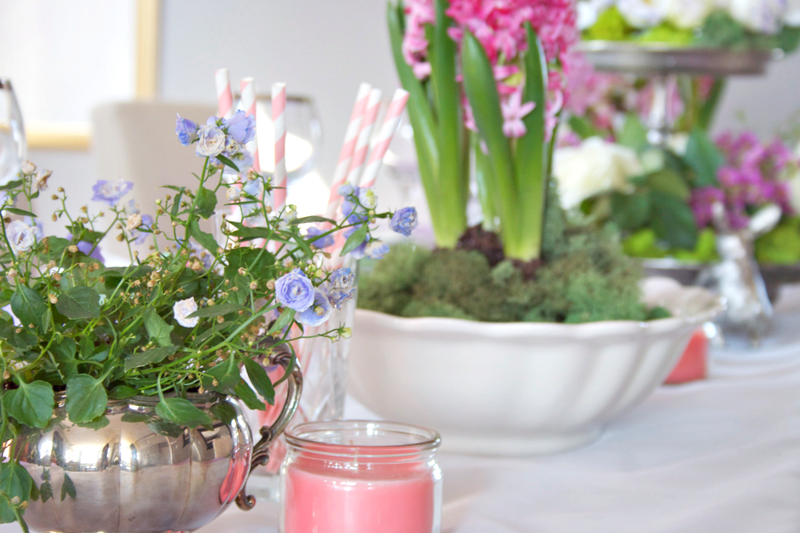 When I think of Easter, spring, flowers, gardens, fresh air and happy colour palettes come to mind, so that was my inspiration when it came to styling our table. 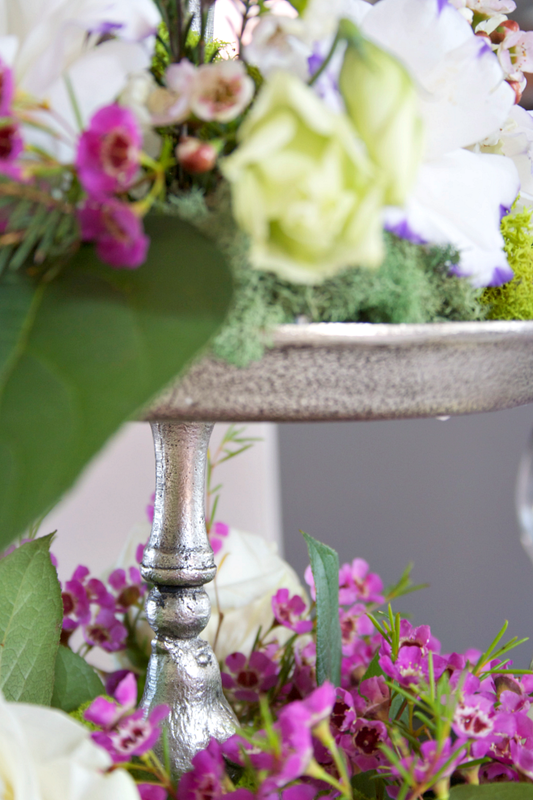 With that, I chose to decorate the Pottery Barn stand with a gorgeous mix of flowers. I had the best time shopping for the flowers, I don't often buy fresh blooms from the flower shoppe (grocery store blooms are pretty much my thing), so any excuse to go all out is fine by me! The stand was truly a great jumping off point. Once the colour palette was chosen, I went out searching for the perfect pieces (I shopped our house first of course!). The fact that the stand has height is an added bonus, making it the true focal point of the table, which is exactly what you're aiming for. 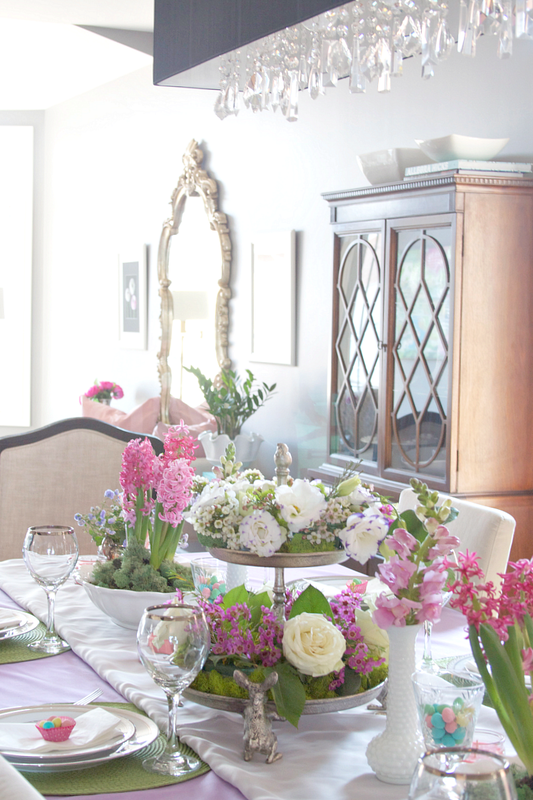 Now, the great thing about going with a spring themed table is that the stores are full of spring blooms, both potted and cut. I can not get enough of either. I flanked the centrepiece with potted hyacinths, which I placed in serving platters (serving platters are my new "go to" for plants, seriously!) and then I used some decorative moss to cover some of the dirt. I chose to place some potted light purple flowers in silverware at either end of the table (I bought just one and divided it into two). Milk glass is always a great option in my opinion (you can often find beautiful pieces at your local thrift store at a great price!). Snapdragons are one of my absolute favourite flowers, I used to grow them in my gardens and think I need to start doing that again! 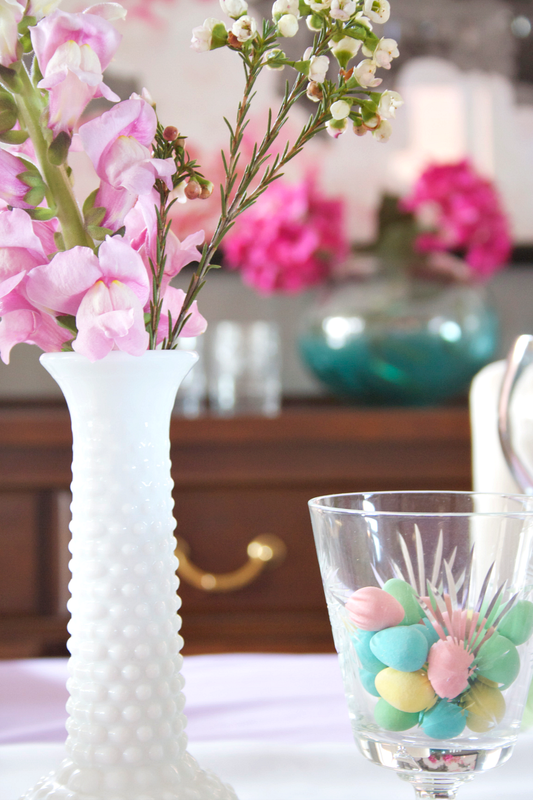 They looked ever so lovely in the milk glass vases and a bonus is that once Easter is over, you can use them throughout the house! I topped the purple tablecloth (which is fabric that I bought by the metre at our local fabric store for super cheap, best option!) with a runner (also fabric from the fabric store. 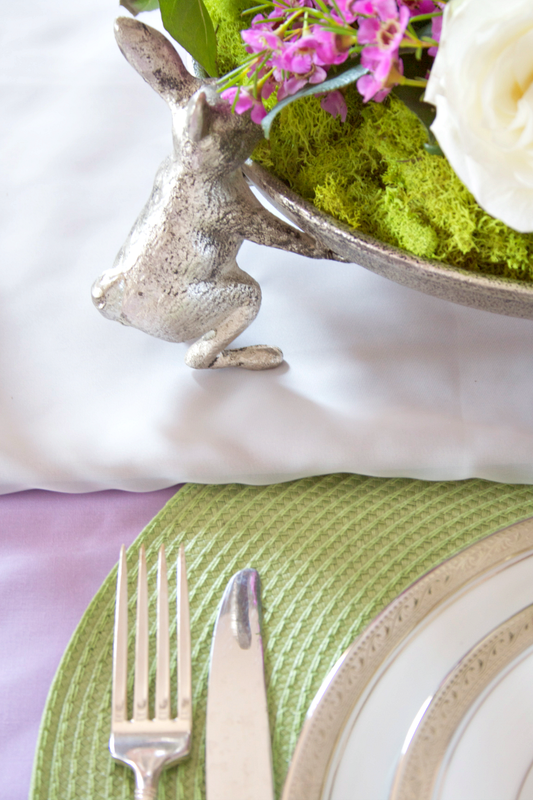 I layered some blush pink sheer fabric over grey cotton) and the most vibrant shade of green chargers. Each place setting was finished off with some holiday themed candy (which by the way is NOT good to have in our house, apparently I have zero will power when it comes to these delicious candies) the candy was placed in mini cupcake liners, both are readily available at your local grocery store. 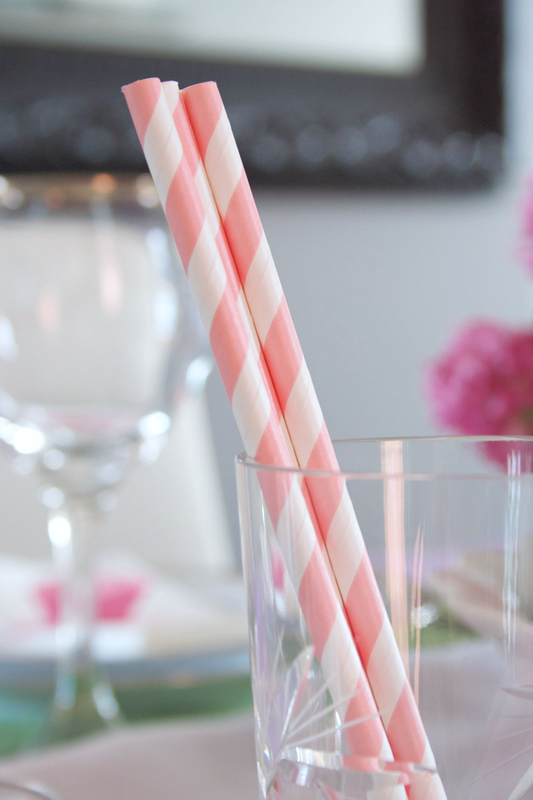 Pink straws in crystal glasses and pink votives finished off the table! 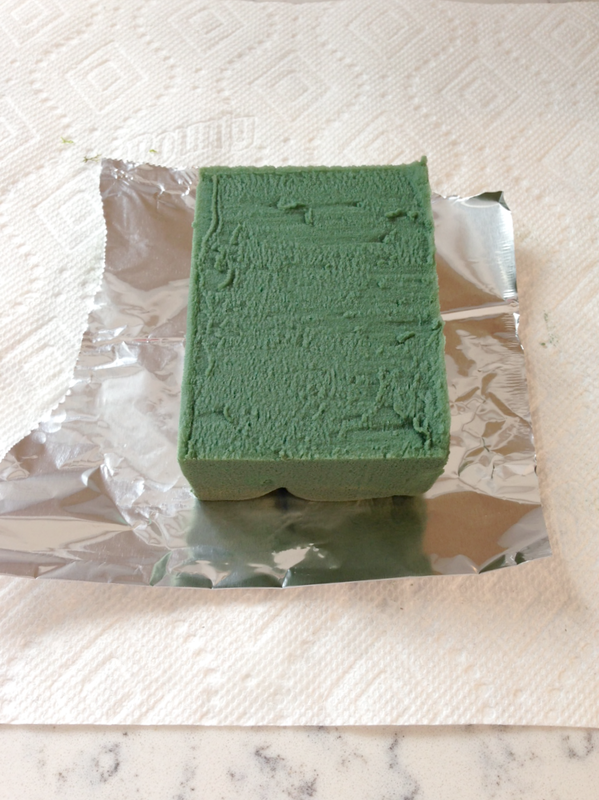 I bought a brick of floral foam (the kind that you can wet) and divided it into even pieces. I figured out that I needed five. I didn't want water to get on the stand, so I wrapped each piece in foil after I soaked the foam in water. Tada! 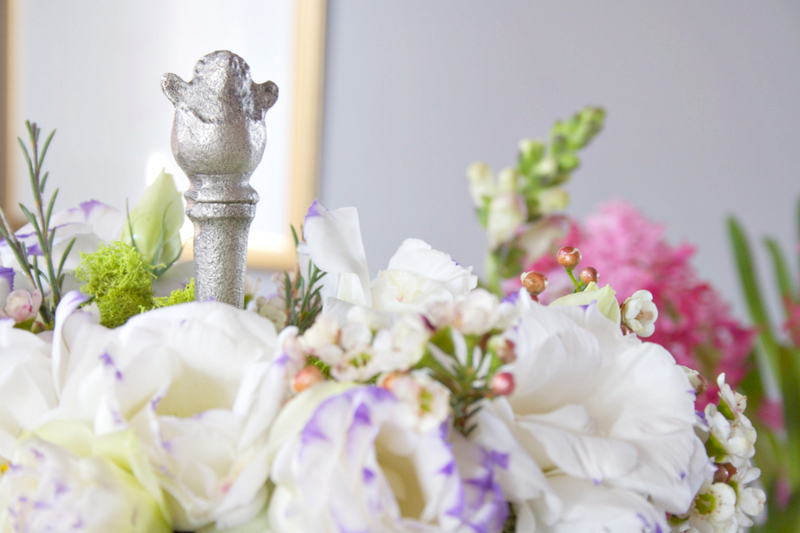 For the flowers, I chose my colour palette (primarily white with pops of pink). I then selected large flowers for the focal point and then smaller flowers and greenery to fill in the gaps. 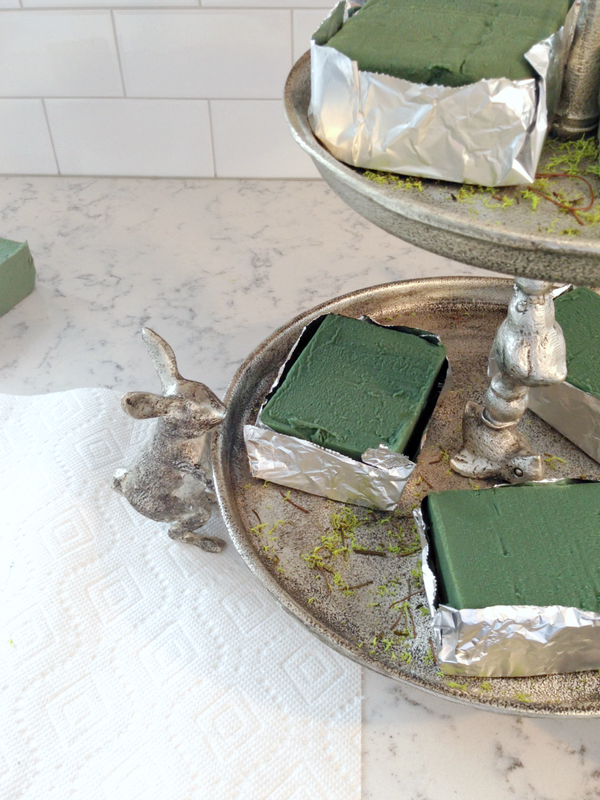 I once again used moss to cover the foam and any empty spots. The flowers have lasted for several days and the stand is dry. Job done! 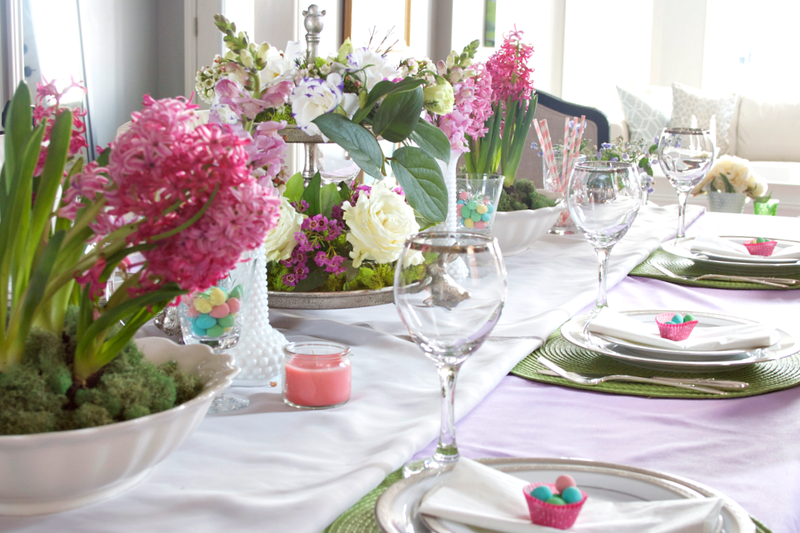 What are your plans for decorating the table for Easter? 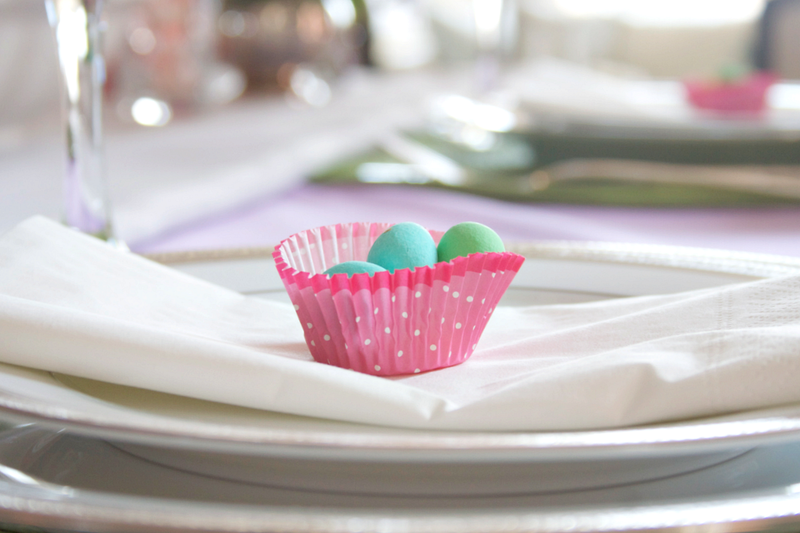 And honestly, please tell me that I'm not the only one who can't resist the deliciousness of those chocolate eggs! What a beautiful table!! I love the flowers and colors you used. Absolutely gorgeous!! 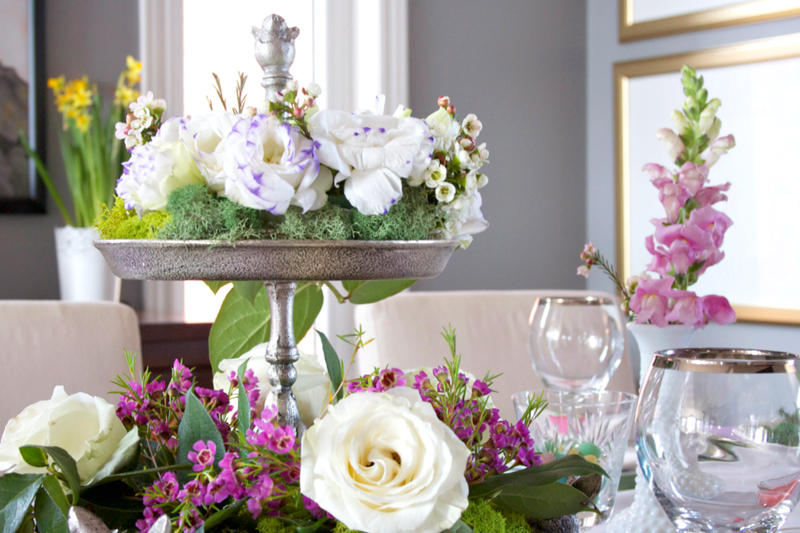 Your table looks right out of a magazine. I love the colours! Makes me so hopeful for spring. This is so bright and pretty. I love the little bunny stand. Makes me eager for Easter! This will be the first year I spend Easter a way from my family, so I haven't been to excited for it, but this changes my mind!